The Photofast i-FlashDrive will transfer your music, photo and movie files between iOS devices, even without a computer. It might look like a plain, two-sided USB and 30-pin dock connector at first glance, but it's more than that. 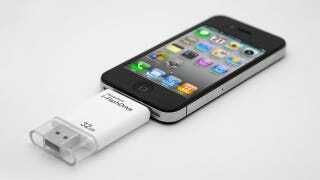 The dongle works like your usual flash drive—it connects to your iDevice or computer, letting you store your files directly on its internal memory (which comes in 8GB, 16GB or 32GB capacities). It doesn't have the ability to charge or sync, so it's not a cable replacement. The dongle comes with an iOS app for file management and works as an external drive on a Mac or PC.